It’s been a few weeks now since we installed solar on our Mantis, and so far we are loving it. Instead of plugging our Mantis in when we get home, we just turn off all the power draws (including the fridge), and let the solar panels bring the power back up and keep the batteries maintained. And out on trips, our batteries can now last much longer. Even on overcast days, we can pull in enough power to stay out longer. And while we are still learning, the Bluetooth module allows us to better understand how power flows through our system. Let’s start by talking about our setup. 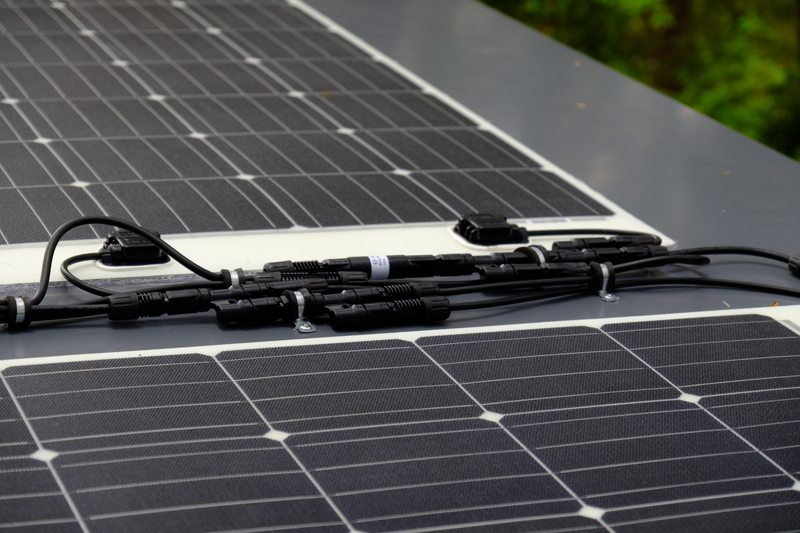 Our solar setup consists of four parts: panels, charge controller, batteries, and inverter. We start our system with three 160 watt Renogy Flexible Solar Panels. We decided on flexible panels as we have a popup roof and did not want to have to modify that mechanism in order to raise and lower the roof without effort. The 3 panels weigh a mere 20 pounds, hardly making a difference in the lift mechanism. These panels are great. They have the same 25-year warranty as all of Renogy’s panels. They are rough and capable of handling tough conditions. And they flex 248 degrees, awesome for any kind of surface you may need. There is a major downside of these particular panels. We didn’t realize when we ordered these that they do not have any grommets in them. This greatly limits how they can be installed, and basically forced us to adhere permanently instead of trying to mount on via grommets. I was tempted to return these, however, in the end, we decided to stick with them. To try to reduce one of the main issues of flexible panels—hot spots due to no airflow behind the panels—I adhered corrugate plastic to the back of each panel. This provided some air space between the metal roof and the backs of the panels. It also had another advantage, as I discovered a hitch in my plans. The Mantis roof is not completely flat. Right down the middle runs a metal strip that helps bind the two sections of the roof into one. Two panels could easily adhere front to back on the roof, but the third panel would have to be turned side to side and run over that metal strip. To solve this, I cut the last piece of corrugated in two, leaving a channel 3 1/4 inches wide in the center of the panel, a perfect fit for the metal strip. The tricky part when trying to adhere a 160-watt panel to a large piece of plastic is placement. I was using 3M VHB tape to adhere the panels to the plastic. On the first two panels, this was easy: I ran the tape around the entire perimeter of each panel, and carefully placed it on the much larger sheets of corrugated plastic. I then cut around the panels using a box cutter with a fresh blade. 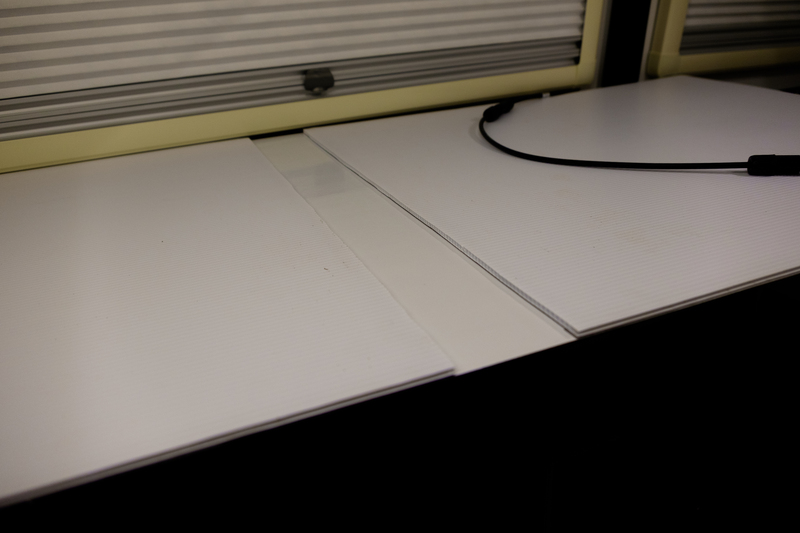 If the panel did not lane exactly square, no problem since I was cutting the already adhered plastic to fit the panel. The third panel, however, would be trickier, because I needed to smaller sheets and they need to be just the right distance apart. Here is where the old adage—measure twice, cut once—became critical. In fact, even after cutting the smaller sections, I found I need to shave a little more off each side in order to ensure the correct fit. Placement of those last two pieces was the trickiest because I needed to line it up exactly on one edge without allowing the other ends to stick. This was a two-person job. My wife, Amy, held the far end so it would not stick to the panels, as I aligned the edges to the top and then the bottom of the panel. Luckily the smaller pieces were a bit big, so I could again, just shave the excess off. Once this was done, the next step was to install these on the roof. Although I had intended to try and get this far, I ran out of time before bringing it to our dealer who would be doing the drilling and electrical work, so they took it from there. They used Sikaflex 252 to adhere the panels to the roof and then Sikasil around the edges to protect against dirt and water buildup inside the channels of the corrugated plastic. Finally, they wired the panels in parallel using Renogy cables and Y adapters. The cables were secured to the roof using cable clamps and rivets. And the cables go in through a small hole drilled right in the centerline of the roof, allowing them to slide into the V-shaped beam inside the Mantis, and hiding the cables from view. Parallel is nice because it means that a single panel won’t affect the others since each is sending its own power to the charge controller. Be careful though, we forgot to account for the increased amps in parallel, and only had a 10 amp inline fuse, which blew out as soon as the panels got into real sun. It was an easy fix, and a 30 amp fuse now handles the load just fine. Next up, is the charge controller. 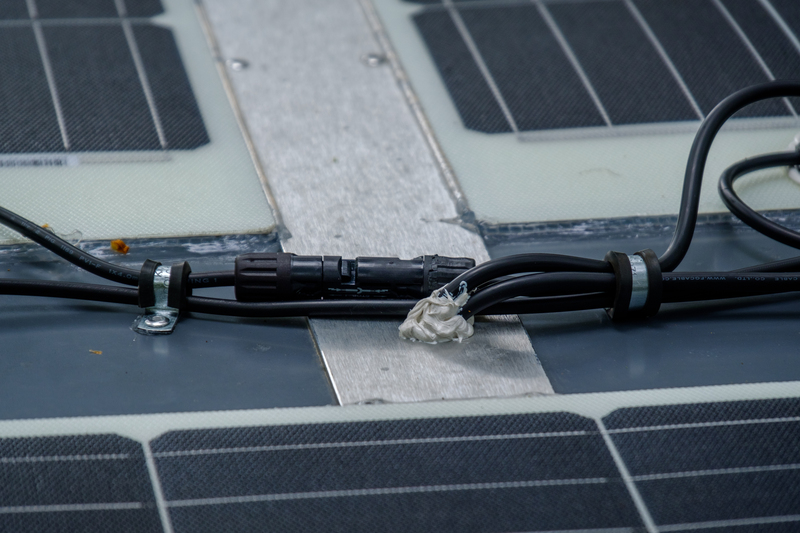 Here is where the positive and negative cables from the solar panels converge. The charge controller is what takes the electricity created from the solar panels and hones it to the best format for the batteries at any given moment in time. This is trickier than you may imagine. For starters, these panels actually output about 19.4 volts, a good seven volts more than the batteries can handle. And secondly, batteries can’t take all the power a solar panel can throw at it indefinitely. Overcharging is a real problem that can damage batteries and even cause fires. The charge controller has to switch its power output to match the needs of the batteries at that moment. We purchased the Renogy Rover 40 Amp MPPT Charge Controller. The Rover includes ports for a battery temperature sensor, PV (the panels), Battery, Load, and a data port for connection to a computer or Bluetooth module. 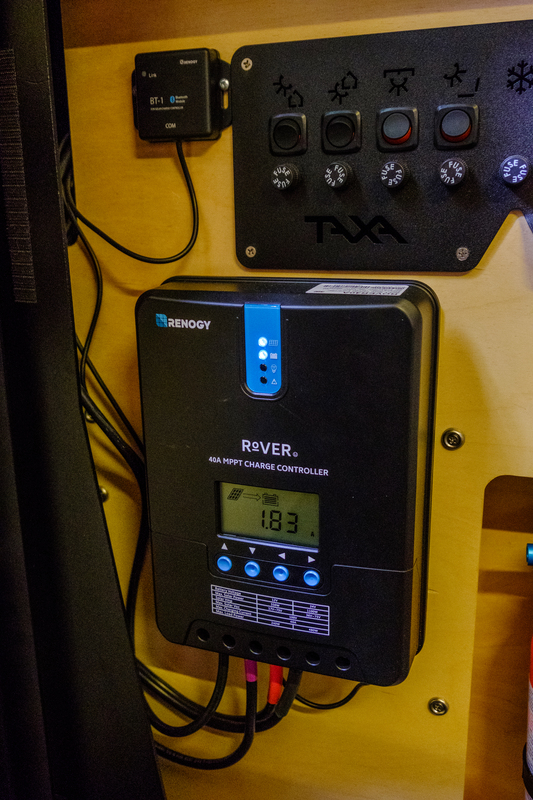 Float: when the batteries are full, the charge controller cranks down what it sends, only sending enough to maintain the batteries from their natural drain. This requires setting the appropriate battery type, or setting user controlled limits. Boost: Since the voltage from the solar panels are often much higher than that of the batteries, Boost mode converts the power, lowering the voltage and increasing the amperage. Bulk: This is the most basic mode, and delivers power directly from the solar panels to the batteries without modification. Equalize: This mode occurs once every 28 weeks. An equalize charge is something that is done for battery health, and pushes the battery a bit past its max voltage capacity, essentially giving it a little refresh. The charge controller handles this automatically in the background. In addition to the charge controller, we also got the Bluetooth Module which was mounted above the charge controller and to the left of the entryway control panel. This little guy allows us to connect our phone to the charge controller to change settings and track historical power intake. Next up in the setup are the batteries. Currently, we have two Interstate 31M-AGM batteries. These are group 31 AGM batteries, which means you don’t need to keep up with water levels. So long as you treat them well—don’t overdraw them and keep them charged when not in use—they should stay strong without regular maintenance. Each battery has a 100 Ah capacity. You never want to use more than 50% if possible, so at 12 volts, it’s about 1200 Wh of usable power. In direct sun, and minus any power draws, our solar panels could charge these in 2–4 hours (depending on conditions). These batteries are likely to last us a good long time when combined with the massive solar array on our roof. 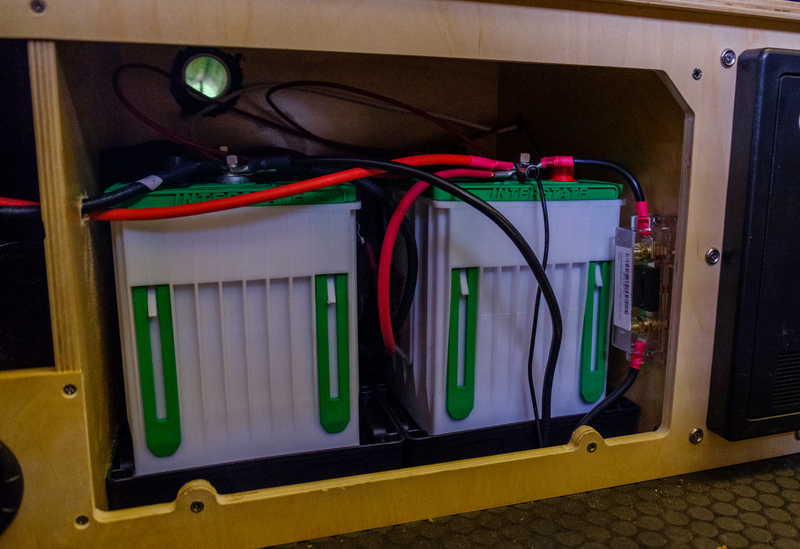 Finally, to round out the setup we added a pure sine wave inverter off the battery bank. This would allow us to make better use of all the power we would be getting on a sunny day. Pure sine is important to run delicate electronics, and we needed something with some capacity to run the things we wanted. We decided on a Xantrex ProWatt 2000. 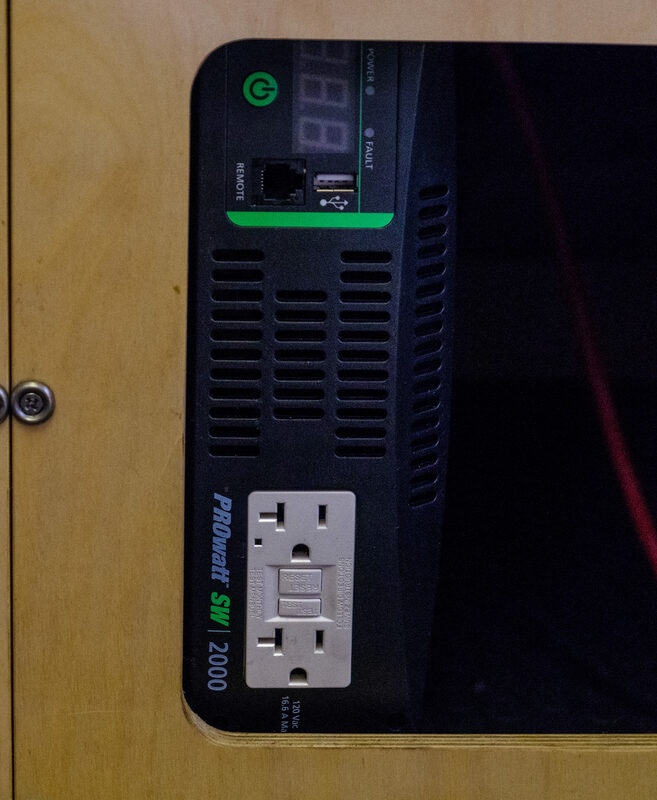 This inverter is actually rated for 1800 watts with a 3000-watt surge. We felt this was just enough to be able to start up our A/C, though perhaps not to do that and other things at the same time. We weren’t sure how often we might run our A/C, but it draws 520 watts when running, so in good light, we could run it off-grid without killing our battery. Sure enough, it can start up and run the A/C. I only ran it for 10 minutes and started from a full battery charge. The battery barely noticed it, and once I turned it off, the solar quickly recouped the energy loss. This inverter does not have terminals to hook directly into the mains on our Mantis, so it had to be mounted where we could easily reach the two outlets it had. We had talked about a few potential locations, and the dealer landed on placing it under the bed, using spacers to line it up so we could access the power button and outlets easily. I really like that choice. It does cover up the digital display, so I can’t read how many watts it’s using, but that could be solved by getting a remote switch. That said, I’m fine without that, and measuring all our power usage could be resolved later with a battery monitor. The one tricky part of this setup is where the wires are. They take up space in that storage area, so I will need to eventually make some decisions about what to do with that space (get longer wires so they can be pushed up against the walls more, or perhaps block the entire area off for an expansion of our battery bay). So with this setup installed, we already have ideas for future plans. Although for the time being, we’ll hold off on the next big expensive upgrades for a little while. I’d love to get a good battery monitor. We currently have a voltmeter tied to the battery, which gives us a sense of where the battery is at, but voltage changes dramatically when there is a current flowing in (now basically anytime the sun is up) and when there is current flowing out. Good battery meters read not just the battery voltage, but also the power in and out, allowing them to get a much more accurate read of the battery state, but also letting us get a better picture of how much power we are producing overall (between plugging into the car, into city power, and the solar) and how much we are using. I love data, so we’d get a monitor with Bluetooth capability to track and better understand our use. The other thing that has crossed our mind is more batteries. If we turned that area under the bed into another battery bay, we should easily be able to fit two more group 31 batteries. That would effectively double our capacity, and allow us to go longer off-grid, especially in the winter or on very hot days where we’d like to run the A/C off the inverter. We currently have a 40-watt Zamp portable panel with its own integrated charge controller. It plugs into the pre-wired port on the outside of our Mantis. The nice thing about having portable panels as well is that they can be placed in the light when the Mantis is in the shade. So why did we get installed panels? It’s just easier. 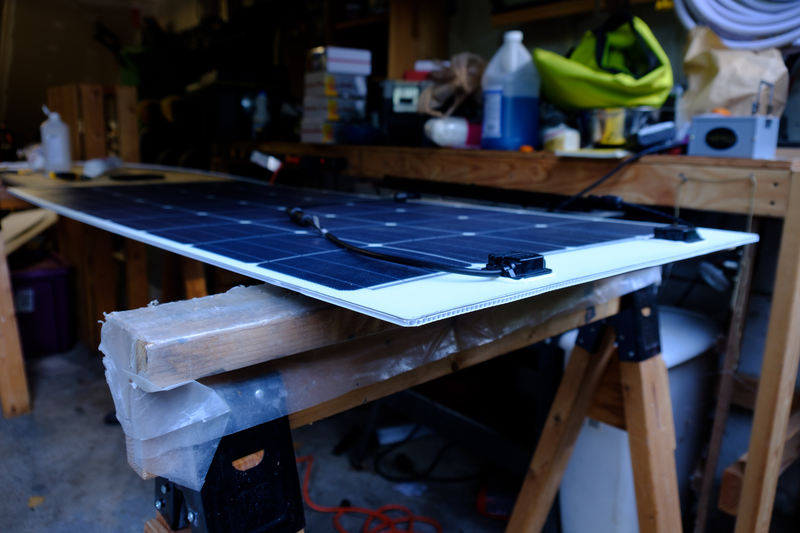 Having to set up and move around our tiny 40-watt panel is a lot of effort, and doesn’t gain us nearly as much as the permanent panels we installed. That said, on a particularly hot day, that panel or maybe an upgrade to an even larger panel could allow us to run the A/C even longer. Or in particularly shading spots, or in the winter, we could angle the portable panel while the roof is stuck where it is. I’m not sure we’ll make the investment in the end, but it’s an idea worth considering. I’ve also seen a setup where the “portable” panel was set to tilt mounts on the tow vehicle. This allows you to move the vehicle and panel into the sun and run a cord to the trailer. Another idea worth considering. I have enjoyed your blog ever since I found out about the Taxa Mantis. I am very impressed with how you handled the addition of solar, I was looking at aluminum panels on the front cargo deck, but it doesn’t look like there is enough room. I like your solution better. Hi John, thanks! I’m glad you have found use out of my site! There’s a recent photo on TAXA’s Instagram feed with a solar panel on that cargo deck. It’s not clear enough for me to see how it’s mounted, but I can tell you that Garrett himself said that mounting on the front cargo deck is a possibility. I’m not sure how, but it might be worth contacting TAXA to see what they advise. That said, the roof is also possible, but if you put heavy framed panels there, you’ll likely need to beef up the lift mechanism.